1/17/2005 – On July 13, 2004 he was arrested at Narita Airport in Tokyo, for attempting to leave the country on an invalidated. Since then the greatest hero of Western chess has been languishing in a Japanese detention facility, now physically exhausted and suffering from dizzy spells. His Icelandic friends, who are offering him refuge, have launched another appeal to the authorities. For those of you who, due to time constraints, principle or religious conviction, are unable to read protracted prose on the Internet, here is a summary of the two documents that we have received in support of the legendary chess champion Robert James "Bobby" Fischer. The full texts are given lower down on the page, and the links in the summaries takes you straight to each of them. The Status Report by Einar S. Einarsson of the Icelandic RJF Committee complains that Fischer has been held for almost six months in jail, and that a month has now passed since he was granted a residence visa in Iceland. Still no tangible progress has been made, the US Embassy in Reykjavik has still not given any formal answers on the matter. The Japanese Authorities, too, are buckling under pressure from the US. When Fischer's assistant asked how long they intended to hold him, a high-ranking official replied, "We can keep him as long as we like. We can eat him if we choose to." Bobby is taking this harsh and hostile treatment admirably well, but he is getting physically exhausted by this very lengthy proceeding over a passport. He suffers from frequent headaches and dizziness. "Six months in a Japanese prison over a passport" is an article by Guðmundur G. Thórarinsson, a former Icelandic Parliamentarian, former president of the Icelandic Chess Federation and chief organizer of the Match of the Century between Bobby Fischer and Boris Spassky in 1972. He describes Fischer's situation: the detainee is allowed to go outdoors for 45 minutes a day, five days a week. He suffers from chronic and worsening headaches and dizzy spells. "For twelve years, this lonely genius has been exiled from his homeland. He has sat in jail for six months because his passport is invalid." Thórarinsson reminds us that Fischer's crime was that he played chess in Yugoslavia in violation of the economic sanctions then in force. In his autobiography Bill Clinton says that the Americans passed this regulation knowing that numerous parties were selling weapons to the Balkan nations, but that no charges were filed in those cases because of the great shortage of weapons in the region. Neither were artists indicted when they worked there. Thórarinsson writes: "The only person in the world to have been indicted for a violation of this regulation – a regulation that has long since ceased to be in force, and a violation committed in a country that no longer exists – is Robert James Fischer. This case is an example of a barbarous violation of human rights." The situation in the Bobby Fischer affair against the US and Japanese Authorities seems to be a stalemate, at least for the time being. Bobby has now been held in detention in Ushiku, the immigration lock-up in Japan, for almost six months. A month has passed since the former world champion was granted a residence visa in Iceland without tangible progress. The US Embassy in Reykjavik has still not bothered to answer formal questions about the matter from the RJF Committee, neither has it given any explanation or information asked for in an open letter to the US Ambassador Gadsden. Although the Japanese Justice Minister Chieko Nohno mumbled yes-yes some three weeks ago and promised to consider Bobby's handwritten plea to the Japanese authorities from his detention cell to be allowed to go to Iceland, nothing has happened. "I also agree to withdraw my lawsuits pending at the Tokyo District Court once the destination of my deportation order is changed to Iceland," Bobby wrote. "Generally speaking, Nohno said, the destination of his deportation will be the United States but we will consider his wishes and whether he has a country willing to accept him as we decide where to deport him". The Japanese Authorities are clearly drawing their legs under pressure from the US. Bobby continues to call members of our group on daily bases, especially his old pal Saemi "Rock" Palsson (picture left), former policeman and famous rock dancer. Still Bobby is taking this harch and hostile treatment admirably well. But understandably he is getting physically exhausted by this very lengthy, six months proceeding over a passport. He suffers from frequent headaches and dizziness. When Fischer's assistant approached the Japanese Authority asking for an answer to the question of how long they intended to hold him there, a high-ranking official is quoted to have replied, "We can keep him as long as we like. We can eat him if we choose to." Bobby was quite amused when Saemi told him of this last and very strange remark and had a good laugh. "Because we knew Bosnia's survival was at stake, we had not tightly enforced the arms embargo. As a result, both the Croatians and the Bosnians were able to get some arms, which helped them survive. We had also authorized a private company to use retired U.S. military personnel to improve and train the Croatian army"
For twelve years, this lonely genius has been exiled from his homeland, bereft of friends and family. And in a case that has few, if any, parallels, he has sat in jail for six months because his passport is invalid. His crime is that he played chess in Yugoslavia in violation of the economic sanctions then in force. It has now come to light that the only person in the world to have been indicted for a violation of this regulation – a regulation that has long since ceased to be in force, and a violation committed in a country that no longer exists – is Robert James Fischer. Former US President Bill Clinton says, in his newly published autobiography, that the Americans passed this regulation knowing that numerous parties were selling weapons to the Balkan nations but that no charges were filed in those cases because of the great shortage of weapons in the region. Neither were artists indicted when they worked there. But the world champion played chess in Yugoslavia, with the result that a warrant for his arrest has been issued in every legal precinct in the United States. The case is so serious in the eyes of the Americans that there is no statute of limitations on the crime. The punishment is a ten-year prison sentence. Bobby Fischer had his passport renewed in 1997; therefore, it had not expired. The United States sent e-mails to a host of countries, informing them that Fischer’s passport had been revoked, but they conveniently forgot to inform Fischer himself. In God’s own country, that haven of individual rights, this detail was forgotten. That fact nullifies the revocation of the passport according to American law because Fischer had the right of protest. The international chess community must certainly vilify the Japanese and criticize them no less than it does the Americans. This case is an example of a barbarous violation of human rights. 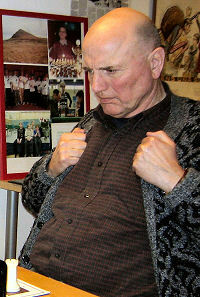 Davíð Oddsson’s handling of Fischer’s case has enhanced his image in the eyes of many people all over the world. Wouldn’t it be right to issue Fischer an Icelandic passport of the type that foreign citizens are able to obtain? Were this accomplished, it would hardly be possible to hold the man in prison on the premise that his passport is invalid. Fischer has expressed an interest in playing chess with Icelandic young people and “Fischer chess” with Icelandic grand masters. Would anyone care to hazard a guess as to what position posterity will take on the United States and Japan’s behavior in Fischer’s case? Guðmundur G. Thórarinsson writes about Bobby Fischer’s affairs. 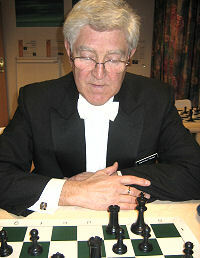 The author is a former Member of the Icelandic Parliament and the former president of the Icelandic Chess Federation. In 1972 Mr. Thórarinsson was the chief organizer of the Match of the Century between Bobby Fischer and Boris Spassky.